Woody Allen lives on an island apart from the rest of the movie world. He avoids the Oscars and other awards shows like the plague, and his films rarely do well at the box office. His movies show up every year like clockwork and include some of our most talented actors. Allen’s directed 43 features in the past 48 years, and it’s easy to take that consistency for granted. I’ve seen 30 of those films, which makes the omission of one of his most heralded movies a surprise. Released in 1989, Crimes and Misdemeanors earned three Oscar nominations, including Best Director. It’s the perfect first choice for my 2014 Blind Spots Series because it’s been on my watch list for so long. Arriving during a string of Allen dramas, it retains his trademark style yet feels different from much of his work. The laughs are undercut by guilt and remorse over a very questionable choice. Allen’s digging into questions of life and death that permeate his films but rarely strike such an emotional chord. Martin Landau stars as Judah Rosenthal, a successful ophthalmologist who’s been married to his wife Miriam (Claire Bloom) for 25 years. He’s also been having an affair with Dolores (Anjelica Huston) for the past two. She’s had enough of his empty promises and will do anything she can to make Judah commit. This is not a wise move. Trapped into a corner and unwilling to give up his respectable life, he enlists his brother Jack (Jerry Orbach) to fix the situation. 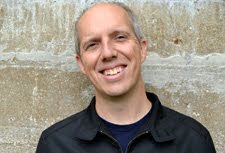 We also follow Cliff Stern (Allen) — a struggling filmmaker in a fading marriage. When he gets a rare chance to shoot a PBS documentary about his wife’s brother Lester (Alan Alda), he may have a shot to change the game. That’s assuming that Cliff really cares about success. He’s more interested in wooing a producer Halley Reed (Mia Farrow), who may not be interested in joining up with a guy with limited career prospects. The title and main story focus on Judah, but we spend quite a bit of time following Cliff. This raises the anticipation that the two leads will cross paths in a major way. Allen enjoys subverting expectations, so the duo only meets briefly during a scene at the end. He’s connecting them more thematically than with the plot. His wife’s other brother Ben (Sam Waterston) is a rabbi who counsels Judah about his predicament, but that’s the only real connection. It’s easy to look at Cliff’s story and wonder why it’s even in the movie. I’m relieved that it exists, though. Allen is charming in his typical role of a director who’s mostly interested in his documentary about a philosopher. Lester is a self-centered idiot, but he’s also a major player. Cliff would rather go to the movies with his niece than focus on his career, and that’s a refreshing contrast to Judah’s inability to step away from his safe life. 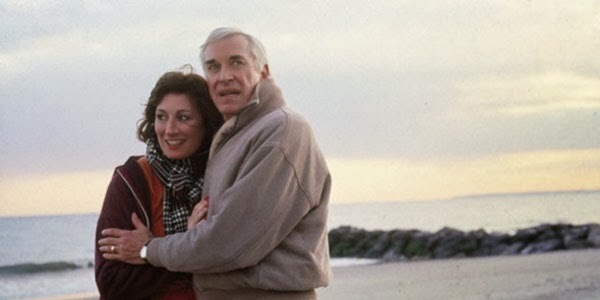 The highlight of Crimes and Misdemeanors is watching Martin Landau shine in a tricky role. He makes us sympathize with Judah because we’re seeing Dolores from his perspective. She’s a loose cannon who’s going to demolish his life at any moment. Even so, it’s clear that Judah has gotten in over his head and bears a lot of blame for the affair. He’s gone too far down the road and has only two choices. Telling Miriam would decimate their family, but the other choice is even nastier. The further Judah goes down that road, the harder it is to stay on his side. When he visits Dolores' apartment after the act is done, it seems like an act of self-sabotage. On the other hand, he’s also working to ensure its success. Following the obvious path of Dostoyevsky’s Crime & Punishment, we’re waiting for Judah’s guilt to ensnare him and send him to prison. Allen plays with those expectations and shows that some people can overcome that voice inside their head telling them about right and wrong. There’s a fascinating scene following the crime of Judah returning to his childhood home and reliving a family dinner. What’s great is the way he interacts with those characters, particularly his very religious father. This feels straight out of an Ingmar Bergman film, particularly Wild Strawberries, and does an excellent job in showing Judah’s thought process. He’s fighting a battle inside his soul and must push aside the guilt or risk losing everything. There’s little conflict for Cliff, who creates a ridiculous cut of the film about Lester that compares him to Mussolini. He’s ready to focus on Halley, who’s a kindred spirit yet may have other options in mind. 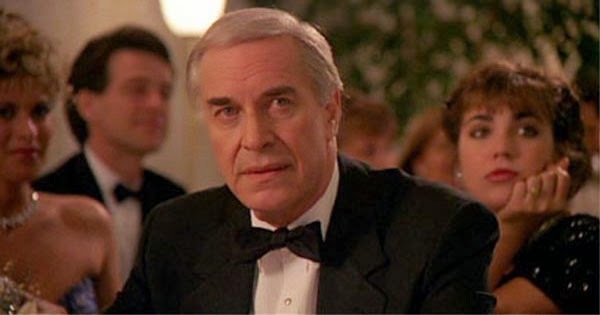 Despite the disconnected lead stories, Allen is working at the top of his game with Crimes and Misdemeanors. It’s a human tale that keeps you engaged right to the end, and the fine work from the entire cast plays a major role. It’s more subtle than the similar Match Point and makes each choice from the leads utterly believable. Allen’s style fits very well inside a crime story, and it ranks among some of his best work. I read Crime and Punishment in college, and it isn't an easy read but has some interesting similarities. I feel like Landau was both sympathetic and pathetic at the same time. You could see where he was coming from, even if you disagreed with what he did. Hey Dan, I just saw on Twitter that your blog just had an anniversary? Congrats!! I had no idea Woody Allen did Crimes and Misdemeanors, I generally don't like seeing him as an actor, I seem to only like his films when he's not in it, ahah. But that said, I'm willing to give this a shot, I like the cast and the story sounds intriguing. Ruth, it's actually a different kind of anniversary; today's my birthday! I don't mind Allen as an actor, but it really depends on the movie. This one is interesting in that Martin Landau is the lead, and Allen's story is nearly totally separate. It's definitely worth checking out, though. I feel this is one of the better Allen films. I really had little interest in his character's storyline, though. In fact, I feel Match Point is a better film precisely because Allen isn't onscreen in it. I don't dislike him; I just don't find the same character he plays in most every film to be that entertaining. Chip, it really varies by film in terms of my interest in the character. I feel like his role in this movie lightens the mood, and maybe that's not such a bad thing. It does feel like an odd inclusion, though. I agree with Chip to the word. I love Landau - Huston storyline and it even makes this film one of my favourites by Allen. But his own storyline is not only uninteresting, it adds very little to this main storyline. I would love this film just as much, if not more, if he edits out his part completely. I can't argue too strongly against your points. I do wonder if Allen thought he needed something else to balance out the story and didn't feel like Landau's story could fill the entire running time. It's hard to say for sure, though, since I haven't read his thoughts on it. This is my favorite Woody Allen film as it's one that plays into that idea of comedy and tragedy but in a very dark way. I don't plan on revisiting any Woody Allen for a while until the next movie as I'm still burned out from that summer of Allen I did last year. I can understand that since you watched so many at one point. Right now, I'm slowly digging through the ones that I haven't seen. A lot of them are from the late '80s and early '90s. I also still need to see the last two. Just wanted to say thanks for writing a January post! I’d leave a longer comment, but I’ve never seen Crimes & Misdemeanors myself – it’s a Blind Spot for me too. No problem, Ryan! I'm really looking forward to all the films this year. You should definitely check out Crimes and Misdemeanors when you get a chance. I think it's right up your alley.